December 27, 2016 (not 2017). 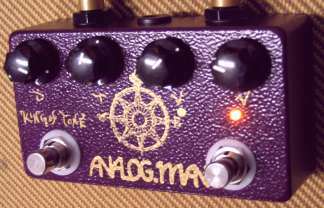 When you get to the top of the list I will email you and you can order one KoT pedal of any available version. If you were on the list before this date but did not see my email, it probably got flagged as SPAM. Then contact me with your email address on the list and I will give you ordering info. Sorry I can't tell you exactly how long the wait will be if you get on it now, but this shipping date should give you a very good idea of the current waiting time. 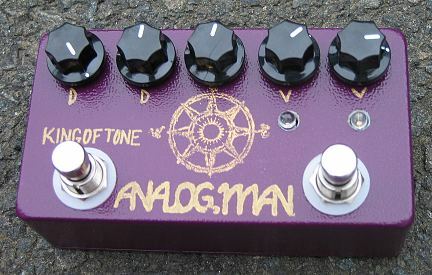 The easiest way to find out the shipping date is to just Google "King of tone waiting list" and you will see the date in the google results. Why the long wait and delays? The KoT was first sold in November 2003 but soon we could not keep up with the demand (like the BICOMP) and had to start up a waiting list. We kept it going pretty well until the spring of 2004 when we just got too busy keeping up with normal orders. To avoid delays to people who paid for other (non waiting list) pedals, we did not send out notifications to the KoT list (or bicomp list) until we got caught up with shipping. This was a very rare occurance. That slowed things up quite a bit to the annoyance of customers who wanted the KoT pedals. But for us it was a way to allow a few hours sleep every night, by taking KoT (and bicomp) orders only when we could process them efficiently. During this slow period of shipping, we came up with the Ver3, 5 knob KoT in late 2004. 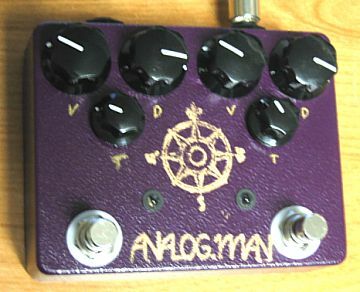 We created it because people were asking for seperate drive knobs and I thought it was a great idea. We already had about the only OD pedal around with two real channels, not just a boost button, but it would be great to have more adjustability on both channels. We made up a Ver3 board and the 5 knob KoT worked and sounded great. But there was some minor popping when turning the YELLOW channel on and off, if the two drive knobs were set quite differently. That is the whole point of the seperate drive knobs, I like the yellow at about 12:00 and the red all the way up, so I was not satisfied. I then spent several months redoing it to reduce the pop with no good results. The circuit just would not allow switching the DRIVE knobs quietly, no matter what we did. Then I got frustrated and had "designer's block". During this time we did not sell many KoT pedals as I thought a new model was just around the bend. We did sell about a dozen 5 knob Ver3 KoTs. Finally in mid 2005 I had a better, different idea so started making a Ver4 KoT board. In October 2005 we made 10 prototypes and they were awesome. Then we ordered and gathered up parts for a few months. Finally in spring 2006 we released the specs and started the list up again, and started shipping V4 KoT pedals (and some V2 and V3 and V2 Jumbos while they lasted). We are totally satisfied with the Ver4 as it's two complete pedals in one box, so we have no plans for a Ver5. We are still backed up due to heavy orders and workload on other effects. I can only process so many orders per day, no matter how many people I have building pedals. So I only email the KoT waiting list people when we are not too backed up on normal orders and shipping. By doing this, I don't have to work more than 70 hours a week usually, and when you get to the top of the list and get your email we can build it and ship it out within a few days. Having the waiting list, and not growing too large when things were good, also helped keep our company strong when the economy got weak. One of our competitors got too big and laid off about 20 people when things got bad. He told the employees to file for unemployment. I had to scramble to reassign people, but nobody got laid off, and we are still in good shape, with sales pretty even in the last few years and picking up little by little. Many other "boutique" companies are selling many times more pedals than we do, by outsourcing the manufacturing and having them made at factories by machines, using surface mount parts. These pedals are not hand-made so they are very hard to repair. If the manufacturer goes out of business (many will in the next 5 years) they are probably disposable. 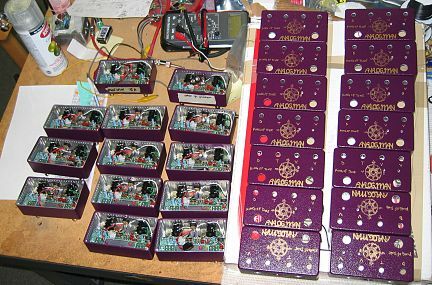 We won't be building pedals like that, even our Prince of Tone which we are having made overseas, uses all the same parts and hand wired construction, so anyone in the world can fix it, and many different types of switches, pots, capacitors, chips, etc will work fine so our pedals can easily be kept running forever. Remember what happened to guitars in the late 60s? The market got HUGE and all these new companies came out, and the old companies (Fender, Gibson, etc) started making too many guitars, of relatively poor quality. Then most of the smaller companies went under, and the big ones nearly did, too. We're not going to make 100 KOT pedals a week, of poorer quality, just to get them out there, and possibly fail as a company. We are still making them by hand, one by one, with the same parts we have always used, even though the KOT/POT diodes and capacitors were discontinued a few years ago. Sorry for the delays, hope you understand that it has been as painful for us as it has for you.